PINK is worldwide known as a feminine color and this obviously makes it a favorite color for the female gender. It is next to impossible to find a dress collection for women that is free from the impact of pink hues. Since such a large variety of shades of pinks are out there, there is definitely a pink that will suit you. Pink is a very flattering shade in the color spectrum, making it a popular hue used for wedding dresses, Whether its formal wear for wedding guests or bridal wear, pink colored dresses can easily be found in different silhouettes and designs. According to the latest trends in Pakistani weddings, pink is worn for almost every wedding function. For a daytime Nikkah function, a complete pink frock dress or a white gharara paired with a pink dupatta will be an eye candy. 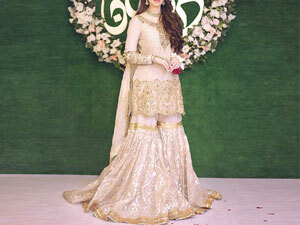 For Walima and Barat functions, brides have multiple styles of dress options to choose from. Pink lehengas, pink ghararas, pink maxis, and long tail pink frocks are a few of the most worn silhouettes for these events. The shade Pink can look beautiful in contrast with almost every other color and is mostly used alongside purple because of the eye-catching contrast it makes. 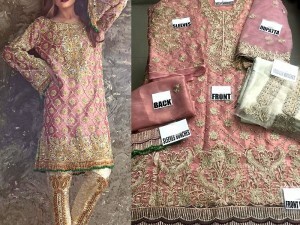 For Mehndi functions, you can pair a pink colored shirt or dupatta with bottoms in a different bright color, to create a mesmerizing masterpiece. There are endless ways you can wear the color pink and even for the wedding guests, it is a very suitable color. From tea pink dresses to reddish pink dresses, baby pink dresses to pastel pink dresses, the shade pink is always an in-trend color with a diverse shade range. If for some reason, pink is an intimidating color for you, we definitely recommend experimenting with different hues of pink and for starters, matching it with another color, to create your dream bridal dress. The use of pink color for wedding dresses, just like the color red, depicts the affection and prosperity. In the Hindu culture, shades of reds and pinks are one of the most worn colors for weddings. With the great influence of Hindu customs on the Pakistani culture, their liking for pinks for bridal wear has been adopted too. Which makes it a no shocker that pink wedding dresses are so common. Another reason for pink bridal dresses has to be the association of women with the color pink. As pink is known as a feminine hue, it is rational that it should be worn on the weddings too.